Flatly I want Wataniya Airlines back! For local travel within the region there wasn’t an airline that could beat its price for comfort package, and the airport was so convenient that every other factor was minimized in comparison. Many people including myself are sick of Kuwait Airport, its a jungle and its frustrating getting to the planes when at Wataniya Airlines it was so easy and enjoyable it didn’t feel like you were in an airport. I got my starbucks, went to the lounge, sat down and relaxed before the flight. These days I dread having these impromptu meetings in all different areas. I have to check Emirates, Middle East Airlines, Gulf Air, Jazeera, Royal Jordanian and any other airline thats going in the direction that I am going. I got used to only being at the airport 30 to 45 minutes before the flight, and now we are back to leaving the home 2 hours before the flight just to be sure I make it or nothing stops us. I’m not the biggest fan of Jazeera since they treat their customers like cattle and if they could charge you extra for being a big guy then they would. 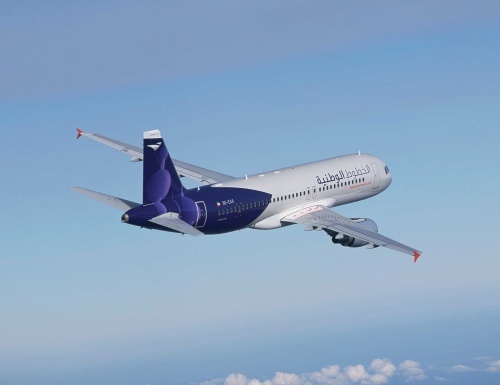 Surprisingly Jazeera increased their prices from 20 to 60% for many of the desitionations right after Wataniya Airways made their anouncement. They still have their deals but it isn’t what it used to be, and its not like they aren’t making a lot of money with all the ridiculous amount of extra fees. 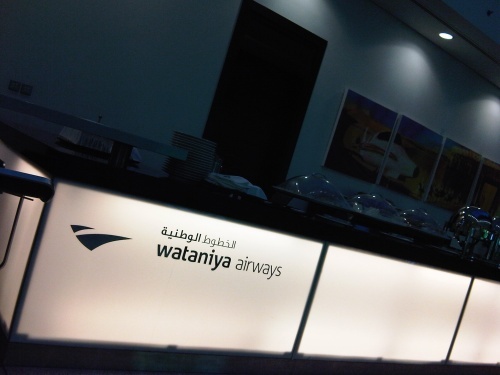 There is still hope for Wataniya Airways yet, and this is just a rumor that Wataniya Airywas will be coming back in different form. A lot of employees have found new jobs after leaving Wataniya because they didn’t know what their job status was and I’m assuming there is going to be a lot of legal issues going on with them. Wataniya Airways is now a nonoperating Airline but they aren’t going to be bought out, what they are trying to do is bid to buy Kuwait Airways. 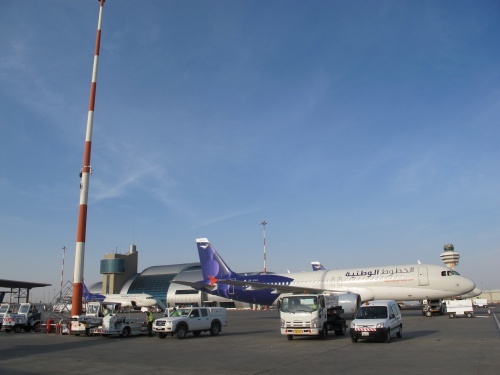 Wataniya Airways have 7 planes, 3 or 4 parked in Kuwait at Sheikh Saad Airport and the rest in Amaan Jordan, and they will have to pay $70 Million to Alafco as part of their lease payments for these planes, and that doesn’t include the other incuring expenses. The rule that has been stipulated in the bid for Kuwait Airways is that who ever bids for Kuwait Airways can’t be an operating airlines, and the government is reaching the final stages to put Kuwait Airways for a bid. So the step Wataniya Airways took is so they would be in prime position to buy out Kuwait Airways, and if they do take over then it would be a fantastic development. I really don’t have a clue how this is going to work out or how long it takes, but I hope it happens soon and I do hope that they take over Kuwait Airways. Previously I posted about the issues that Wataniya Airways are going through and that have caused them to drastically change their operations and let go of quite a few people. 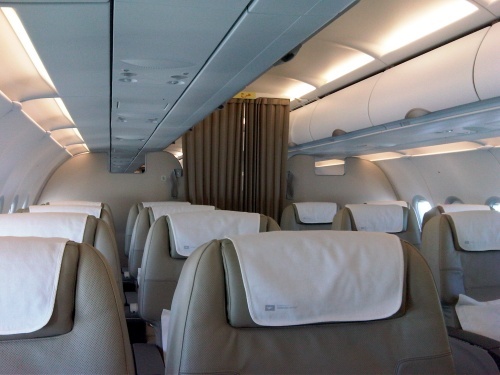 My preference when flying around the Middle East is still Wataniya Airways and I had a trip to Dubai so I just check Wataniya and book the flights that were available. Its still the same good service that I am used but the flight times or frequent number of flights changed. Now its only twice a day to Dubai, I hope they don’t change that either. The ground staff is just as friendly, and the plane staff are just as good, the plane was about 70% empty but its a Saturday flight so I wasn’t expecting it to be full. But you can feel the atmosphere at the airport, it feels desolate and people are not in the best of spirits. Honestly I’m just going to keep flying Wataniya Airways as they are my preferred airlines, and I hope they get back in shape and plane more routes. The last few weeks have been insane! I just can’t believe how meetings I have been to and how long some of them take, and I had to fly to Dubai out of the blue for an urgent meeting, I took the night flight instead of the 7 am flight, it would cut too close to my meeting and any delays would have been a huge problem. I really didn’t feel like taking off since I had too much on my plate already, I wished I could have cloned myself to manage everything that I had to do. Sleeping isn’t an option these days and writing reports, visiting family and getting some personal work done, all before a Eid trip. I honestly felt like I have been running for the past few weeks with very little breathing room but I love when I get work done, and I know I keep saying this but there isn’t enough time in the day. And this weather is just amazing, I hope it continues to be this good until at least April but thats probably hoping for too much. At one point in Dubai Airport I fell asleep at the Gate and the Wataniya Airways staff woke me up to board the plane back to Kuwait. I was one of the first people there but the last to board. I was so exhausted by the end of the day that I passed out. It was a choice between being hungry and being sleepy, I couldn’t even wait for food, I passed out before take off and I leaned my chair back not caring that we haven’t even moved from the gate yet. I’m hoping to catch up with some rest in the next few days! One recommendation, if you have lots of work in Dubai and want to check out late I recommend that you stay at The Address Club Rooms or Suites. They have an excellent policy of your check out time being the same as your check in time. So I came in at night around 11 pm then my check out is 11 pm the next day. So I had meetings from 9 am until about 3:30 pm, I went back to my room and napped for about 30 minutes before taking my time to check out which is fantastic. The normal room is 114 KD but the Club Room was 154 KD, but I would have paid for half a day which would cost an extra 70 KD because they charge half the normal rack rate, so overall its much better to get the Club Room if you need to check out late. I for one don’t like packing up and leaving early from the hotel and going to meetings and dragging my carry on with me, even if I’m going to walk around the mall. A lot has been going on with Wataniya Airlines over the past 6 months. They got a new plane, now it seems like they have a total of 5 planes, and more staff hired. They are now even changing the way you check in at first class, and now as soon as you check in, you can have your passport stamped right away so you only have to go through security to board the car to the plane. Now they are even expanding the First Class lounge as they are expecting more and more people which is a great idea, I think they can even have more seeting inthe current area without any issue. So the old passport area for first class being turned into a lounge for First Class. The best part now is that they offer Zaijil Wifi services in the lounge and airport, so you can purchase 2 hours for 1 KD or 24 hours for 3KD, and you can do the whole thing and charge it to your Zain mobile phone by sending a few sms which was extremely easy, and I was online with my iPad. Now this makes it easier to sit early in the lounge and relax without any issues. 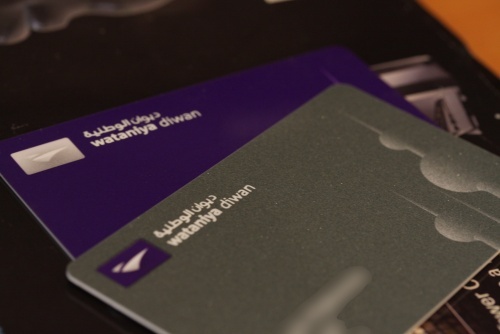 I have been flying Wataniya Airways continously throughout the Middle East and so after a couple of months I go to the Silver Diwan Card from the Purple Card. So even if I fly economy I get to use the lounge now and also get one person in with me which is pretty good for Silver, usually that doesn’t happen until your Gold with Emirates and that takes a lot to get there. I just hope they open up more routes and hopefully to London soon with a new plane that can fly a longer range, as it is right now British Airways is too expensive and the services are lacking for that price. 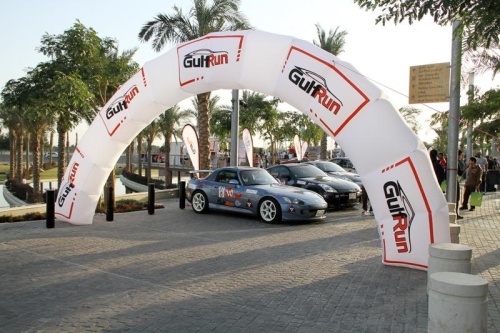 GulfRun @ 360 Mall was one the best car shows that I have seen in Kuwait yet. The number of assembled cars was fantastic, a number of interesting machines in the show, my favorite being the Porsche 995 Gemballa, that is a true racer, a monster of a machine. I like it was separated, I was thrown on the German side next to my twin sitting next to my M6, looks like its going to be an interesting race this year with such a variety of machines. The machines I worry about the most are those Mitusbishi Evolutions, they are machines to be feared. The way they look has no indication of what can be under the body, some can be monsters at 600+ bhp and others can handle like go carts. Then there is that Nissan GTR which looks really good in red, I’m curious what the Mercedes SLR is going to be doing on the track against all these machines, then there is the other 20 cars which weren’t at the car show since they were getting worked on. I had a meeting to get to, organized the next day in Dubai before I even looked at the timing of the flights, luckily Wataniya Airlines flew early enough and I booked on the 7 am flight. I didn’t realize that 7 am would mean that I would have to be up by 5 am to take my time and get to the airport by 6 am. I got to the airport and boarded my flight, it was still dark outside. My flight back was around 6 pm so I had a few meetings get it done, then a bit to eat and head back to Kuwait. Took a few episodes of Supernatural with me on the flight, I am addicted to the show so I have a few episodes with me. I do enjoy flying Wataniya Airlines but I hate the Marhaba lounge in Dubai Terminal One, its uncomfortable and tacky but landing at Sheikh Sa’ad Airport makes up for it. 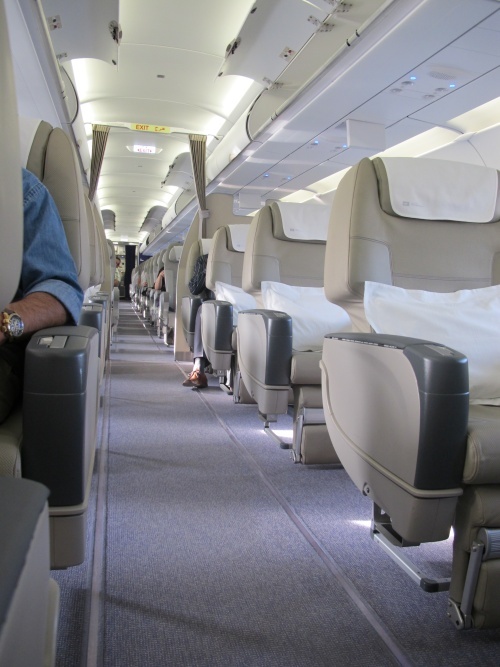 On the early morning flight I was the only person sitting up front, it wasn’t that full in economy either. I wonder when these flights do get full during the week, but on the way back it was a little more full. 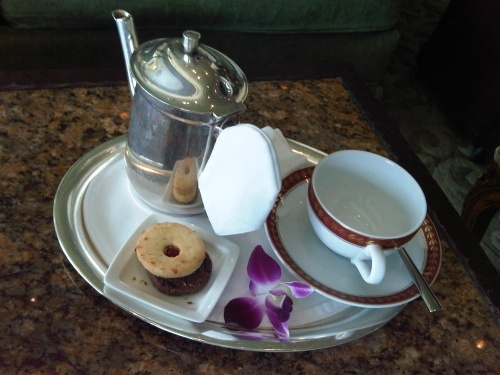 Had a couple of arabic coffees to keep me awake, I almost ran out of battery that time in the day but still had a few things left to do. The best part of landing is walking out so quickly, and out to my car to head home and relax for a little while. 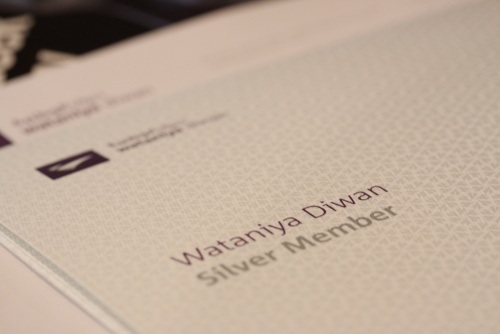 I got my Wataniya Airways mileage card after using it once, it starts off at purple and heads up from there to silver and gold. 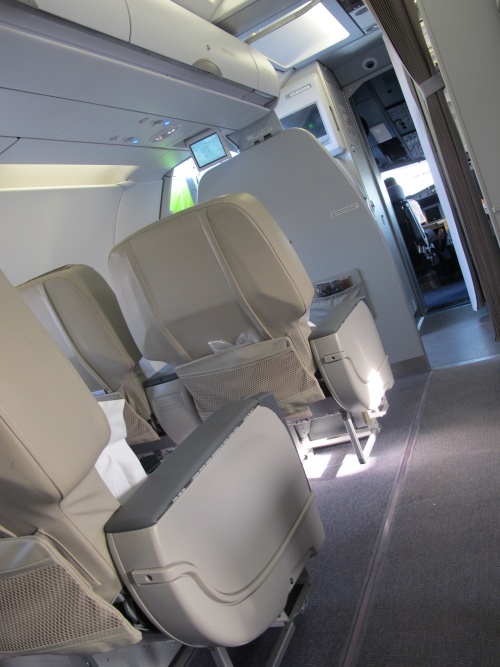 The best part of overall is that there really is a lot of bonuses with the mileage, other extras such as using the lounge, having a large family with transferable miles and you can buy more miles online. I talked about the card services in detail in this previous post, but right now I’m going to take advantage of it during my trips. I called and asked, they also said you can claim trips after October 1st, since I have a few round trips I’m going to claim those for these trips. I might have enough to bump me right to silver based on my works trip, I do enjoy when you can really take advantage of these mileage cards. You can easily sign up online with the link below. Took the Wataniya Airlines flight to Bahrain at 7:50 am for an 11 am meeting, landed around 9 am and rented the Primo Limousine car service to take us around for the two meetings and then back to the airport but for a late night 10 pm flight back. 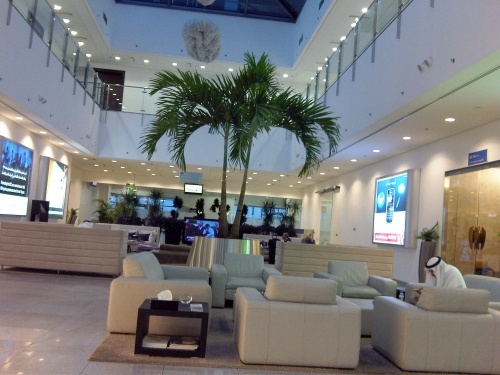 Every time I go through the Bahrain Immigrations I enjoy how nice they are and they are always joking around, this is the one airport they are nice to everyone coming through. We headed to the Ritz since our meetings were two minutes away from it by car. We had some tea and check our meeting point and presentations before heading in. Also the Ritz is a rip off, a 2 hour internet card is 10 BD which is ridiculous, plus the standard room with tax was for 200 BD which is insane. We headed to the meeting, then lunch at the Indian restaurant in the Ritz then the second meeting. Then off to the airport after some relaxing, we got there around 6:30 pm and I assumed it would be open by 7:30 pm but I was mistaken they only open the check in counter for Wataniya an hour and a half before the flight and so we were waiting with those going to Hajj until it opened. But by 8:30 pm we managed to check in and went to the Dulan lounge which is the first time I stay there and I have to say its amazing, probably one the best I have seen. One thing I do enjoy is that Sheikh Sa’ad Aiport is very easy to enter and leave from without any issues, and as soon I did I got my car out of the parking and heading home. 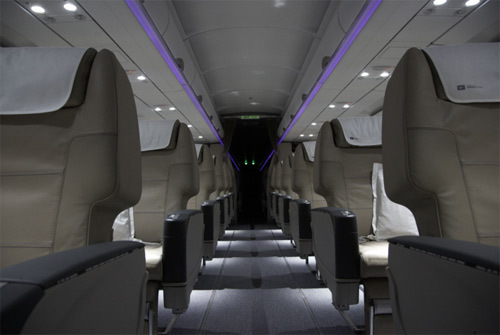 This is the one thing that Wataniya Airways have been missing and its a frequent flyer program, now they have finally launched their service I was looking at the details. 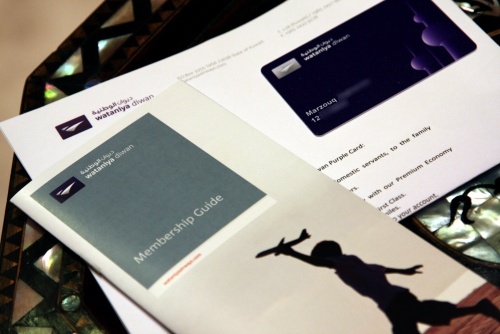 They have really put an effort into catering this frequent flyer program to the families in the Middle East, you can register up to 8 family members including 2 domestic servants, and managing the account as head of the family for all the members so you can share your awarded miles and tickets between each other. You get this when you sign up! You can get your Gold or Silver membership for a long time if you keep it for over three consecutive years at that level. I think this is a fantastic program, really giving out rewards and making sure that people have different ways to benefit from the rewards program and see some results from it. I already signed up for it, and it was very easy, now I’m signing up the rest of the family.